That is good news because many countries compete for the FDI pie. How does the country compare with others? If your only investor is China that speaks volume about you. When China sinks due to its own debt internal bubble which is huge so will your stupid projects like cpec which are too much dependent on interests of one country namely China. Anon: "If your only investor is China that speaks volume about you. When China sinks due to its own debt internal bubble which is huge so will your stupid projects like cpec which are too much dependent on interests of one country namely China. " Wishing ill on others will not help you. First, read the post again to see if it says China is the only investor? Did you see the mention of UAE anywhere in it? Unlike your country India (I'm pretty sure my guess is right) that depends on massive western money inflow, China has over $3 trillion in reserves and massive exports. Wrong data. FDI in Pakistan was about 700 million in 2014-2015 and it is still under 600 million in 2015-2016. Actually net FDI is about Zero, because more money is going out then coming in. KARACHI: Pakistan received foreign direct investment (FDI) of $709.3 million in 2014-15, which is 58.2% less than the FDI received in the preceding fiscal year. According to data released by the State Bank of Pakistan (SBP) on Wednesday, FDI decreased by $989.3 million year-on-year in July-June, as it amounted to almost $1.7 billion in 2013-14. The huge year-on-year difference in FDI is mainly on the back of the auction of the telecom spectrum, as the one-time sale of 3G/4G licences had fetched the government $610.9 million in May 2014. Shahid: "Wrong data. FDI in Pakistan was about 700 million in 2014-2015 and it is still under 600 million in 2015-2016. Actually net FDI is about Zero, because more money is going out then coming in." FDI Markets is considered a reliable source of cross-border investments data. It relies on real project investment data, not what the central banks report. Advise you to look at AT Kearney which is a forward looking analysis. The Foreign Direct Investment Confidence Index®, established in 1998, examines the overarching trends in FDI. The top 25 ranking is a forward-looking analysis of how political, economic, and regulatory changes will likely affect countries' FDI inflows in the coming years. 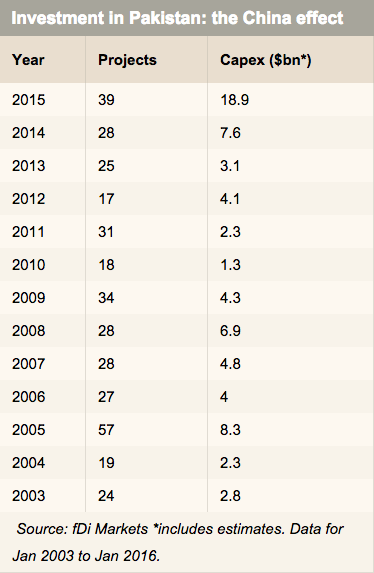 Over its 17-year history, there has been a strong correlation between the rankings and global FDI flows. Since its inception, countries ranked in the Index have consistently received at least half of global FDI inflows roughly one year after the survey. Are we talking about CapEX or FDI? There is a difference. Please clarify. People are getting excited by just watching the top of the ice berg. Give till the end of 2018, and then see how fast the FDI's grow, the US, the Brits are lining up certain investments to put their multinational companies in there for major competition as higher quality products (yet more expensive. People in Punjab should already start to see more custom local and Western brands being pouring out to all major cities. By 2018, some deals in offshoring IT and other areas like Healthcare, will start to take place too. Post 2018, there will be investments well in excess of $ 75-100 billion a year going in. On a second thought, the difference may be as SBP measure on dollars pouring in. While all Chinese projects have no financial transactions. They just send machinery and builders. And no money crosses the borders. SQA: "fudging of Data is not just an Indian phenomena,we Pakistanis can play with the best of them"
Unlike India's fudged GDP data, the source of the data in my post is not Pakistani government or its institutions. It's fDI Markets, a Financial Times data service. Riaz Haq:"India's fudged GDP data"
Nor a failing economy can invest too much in huge construction, R&D development projects in own and other countries unlike India. There's no advantage of any government in faking numbers which can harm their bid later. A faking country can't maintain at position where India is. MoA: " If Indian GDP numbers are fudged, then, other countries won't be investing so much in India too make it biggest recipient of FDI in entire world last year (ahead of both China and United States)"
If the Indian GDP revisions by Modi govt are so credible, why is it that even the RBI governor Rajan doesn't believe them? Sometimes you argue that Pakiland has been one of the most successful Asian countries in creating a large and vibrant middle class. At the same time, in this article, you tout low labour cost as a cost advantage, even over other poor countries like Vietnam. Both cant be simultaneously true, can they. Or is it that Pakiland's middle class is willing to work for even less than other poorer Asian nations? Majumdar: "At the same time, in this article, you tout low labour cost as a cost advantage, even over other poor countries like Vietnam. Both cant be simultaneously true, can they. Or is it that Pakiland's middle class is willing to work for even less than other poorer Asian nations?" ADB data shows that Pakistan has been quite successful relative to its neighbors in terms of providing upward mobility to its people. Removing barriers to investment such as access to plentiful energy and better infrastructure will make it even more successful. India's trade deficit with China increased to $51.86 billion in 2015, Parliament was informed on Monday. "Increasing trade deficit with China can primarily be attributed to the fact that Chinese exports to India rely strongly on manufactured items meeting the demand of fast-expanding sectors like telecom and power while India's exports to China are characterized by primary products, raw material and intermediate products," commerce and industry minister Nirmala Sitharaman said in a written reply to the Lok Sabha. She said India's trade deficit with China stood at $51.86 billion, with a bilateral trade of $71.22 billion in 2015. During this period, India's exports to China came in at $9.68 billion while imports were $61.54 billion. I think the FDI totals represent the full value of the projects, but the cash will be spent over several years. I would find it hard to imagine that this much could be invested in a 12 month period in Pakistan's economy. 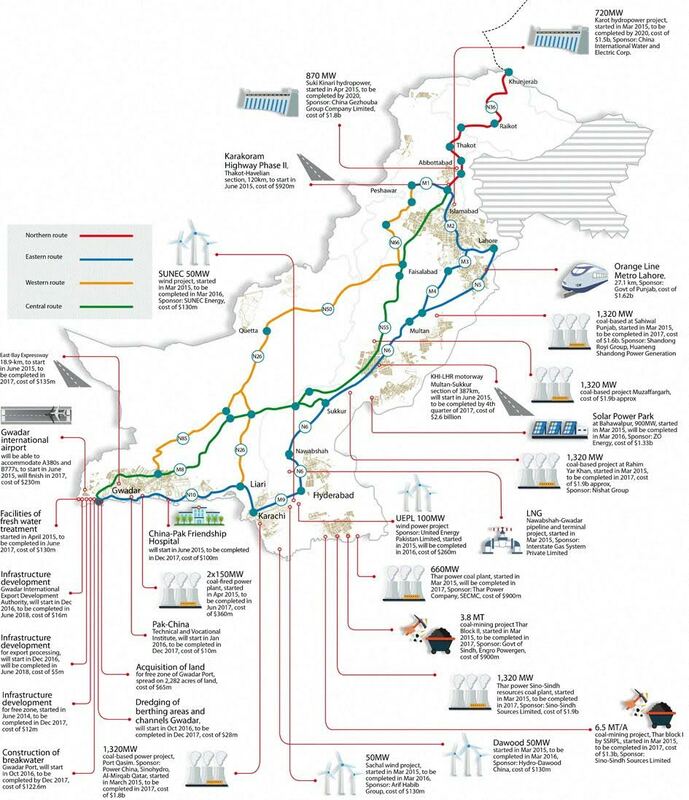 This does not minimize the importance of CPEC, a massive upgrade of electric power and transportation links in Pakistan will play a huge enabling role in the growth of the overall economy. These investments will come to fruition over the next couple of years. Pakistan’s predicted annual growth rate for the next 10 years is 5.07%, according to the Center for International Development at Harvard University (CID) research published recently. Pakistan's projected growth rate of 5.07% over the next 10 years is the 12th highest in the world, according to Harvard CID. Pakistan’s two giant neighbors – China and India – are predicted to grow by 4.28% and 6.98% respectively. Egypt (5.83%) and Philippines (5.68%) are the only economies among Goldman Sachs' group of Next 11 countries that will grow faster than Pakistan's. Pakistan’s 5.07% growth rate is above China, which is set to grow by 4.28%. Except for India, Pakistan will beat all regional economies in growth. DARWIN, Australia — The port in this remote northern Australian outpost is little more than a graying old wharf jutting into crocodile-infested waters. On a recent day, there was stifling heat but not a ship in sight. “Our pissy little port,” as John Robinson, a flamboyant local tycoon, calls it. The financially hurting government of the Northern Territory was happy to lease it to a Chinese company in October for the bargain price of $361 million, raising money for local infrastructure projects. But the decision has catapulted the port of Darwin into a geopolitical tussle pulling in the United States, China and Australia. It may not look like much, but the scruffy port is a strategic gateway to the South China Sea, where China is challenging the United States, and it serves as a host base for the United States Marines, who train here six months a year. Critics contend that the Chinese bought a front-row seat to spy on American and Australian naval operations. “There is a deep Chinese interest, driving interest, in understanding how Western military forces operate, right down to the fine details associated with how a ship operates, how it is loaded and unloaded, the types of signals a ship will emit through a variety of sensors and systems,” Peter Jennings, a former Australian defense official who is now the executive director of the Australian Strategic Policy Institute, told a parliamentary inquiry. China has invested in more than two dozen foreign ports around the world, including a port in Djibouti adjacent to an American military base. But the 99-year Darwin lease was the first time the Chinese had bought into a port of a close American ally hosting American troops. The Australian government did not consult with Washington, and the parliamentary inquiry showed that the corruption-plagued and unpopular government of the Northern Territory, of which Darwin is the capital, had rushed to lease the port to raise money for new projects before an election. A leading rights group in Pakistan says deaths due to violence-related incidents, including bombings and other militant attacks in the country, fell 40 percent in 2015. In its annual report released Friday, the independent Human Rights Commission of Pakistan (HRCP) documented 4,612 deaths compared to 7,622 fatalities in the previous year. The findings support official claims of a reduction in casualties because of successes in the army's counter-militancy operations against bases of the anti-state Pakistani Taliban near the Afghan border. The report comes after Sunday’s suicide bombing in a park in Lahore that killed at least 72 people, including members of the minority Christian community, who were celebrating Easter. Speaking to reports at the launch of the report in Islamabad, HRCP’s Kamran Arif told reporters his organization recorded 706 militant attacks in Pakistan, the lowest number since 2008. Construction on a logistics complex that will deepen bilateral trade between China and Pakistan began in Xinjiang on Friday. According to the government, the project that began in Tashkurghan Tajik county covers an area of 883 mu (about 58 hectares) and will take a total investment of 3 billion yuan ($464 million), Xinhua reported. The first stage of the three-stage project includes an internet service administration centre, a cross-border e-commerce enterprise incubator, and a modern warehousing and logistic centre, Xinhua reported. In the meantime, a comprehensive transportation system, especially for cross-border and cold-chain logistics, will be further developed. RMB settlement will be introduced as well. Further stages will see the completion of a commodity exhibition centre, manufacturing and assembly factories, hotels, entertainment facilities and vehicle maintenance station. The county of Tashkurghan sits 3,200 metres above sea level in the Pamirs, linking Xinjiang's Kashgar and the port city of Gwadar in Pakistan. The county's Karasu Customs, China's only land port open to Tajikistan and an important post along the planned China-Pakistan Economic Corridor, officially opened last year after 10 years of preparation. KARACHI: Pakistan’s economy will pick up further during the second half of the current fiscal year thanks to the stable growth in large scale manufacturing sector on the start of multibillion rupees resource projects and a good winter rains this season that will bolster agriculture production, the central bank said on Thursday. The bank, however, kept its growth forecast unchanged at 4-5 percent for the current fiscal year of 2015/16. The SBP’s growth forecast is still below than the government target of 5.5 percent. The economy grew at a rate of 4.2 percent in the last fiscal year ended June 2015. The central bank said a stable macroeconomic environment means that the economic growth would maintain the momentum. “We expect GDP growth during the FY16 to be higher than the last fiscal… We are optimistic on the industrial sector’s performance but cannot firmly assess the final outcomes in agriculture and services,” the SBP said. It said the growth momentum in large scale manufacturing (LSM) continued to remain strong in the first half of the current fiscal year, supported by better energy supplies, lower commodity prices and accommodative polices. The LSM sector grew 3.9 percent in the first half of the current fiscal against 2.7 percent in the previous year of the same period. Major contribution to LSM growth came from auto, fertiliser and construction allied industries. On the agriculture sector performance, the central bank said the prospects of surpassing targets in wheat and value addition in livestock are strong. “While initial estimates suggest a decline in area under wheat cultivation, a marked improvement in yields has increased hopes for a bumper for a third year in a row; timely rains and better input availability have reported improved the per-acre harvest,” the bank said. The central bank highlighted the public debt servicing obligations, which were not more than six billion dollars per annum until 2020. “Debt servicing of $5 billion due on 2016 are well within manageable level considering the present level of foreign exchange level,” the central bank said. The SBP estimated the current fiscal year’s inflation at 3-4 percent below the target of six percent. “The global commodity prices are not expected to recover anytime soon, and on the other, a stable Pak Rupee is likely to keep inflation expectations further at bay,” it added. The central bank maintained the lower inflation estimates on the government move to reduce domestic petrol prices by 6.6 percent and 11.9 percent in February and March 2016, respectively, following the freefall of oil prices to a 12-year low level in the international market. The bank said measures taken by the government in October 2015 would help the Federal Board of Revenue to maintain revenue collection growth. Expenditures will remain within target, it added. It said that the decline in oil prices allowed a 39.8 percent fall in the country’s oil import bill, helping reduce the trade deficit by 1.6 percent in the first half. Furthermore, the pass-through of low prices by the government has contributed in pushing down the consumer price index inflation to a multi-decade low. One of the ma-in challenges Pakistan’s eco-nomy faces to-day is power supply. Prime Minister Nawaz Sharif’s government has said that it plans to improve Pakistan’s power sector through reform and investment to boost growth, and hopes to end chronic power shortages that have crippled the economy for years. So, it has made real strides to tackle this issue head on. Federal Minister for Finance Ishaq Dar has been praised for undertaking structural reforms to create an investment friendly environment, especially in the energy, infrastructure development, large-scale manufacturing and agricultural sectors. The showpiece of this policy is the Integrated Energy Plan, which aims to achieve self-sufficiency by generating 50,000 megawatts (MW) of power within the next 25 years. While addressing the recent National Energy Conference on Prospects of Power Generation, organized by South Asian Strategic Institute University in Islamabad, Minister of Water & Power Khawaja Muhammad Asif said that to develop a concrete road map for a secure energy vision for the future, the nation must work at developing indigenous scientific and industrial capacities to explore domestic energy reserves. “The government is making every effort to increase electricity supply to the national grid through all possible avenues, private sector being one of them,” said Mr. Asif. He also explained that the geographical position of Pakistan not only makes it a potential energy exporter, but also a trade and energy corridor for South and Central Asia. And due to this advantage, Pakistan can maneuver itself in a way that significantly increases its bargaining power in the region and beyond, thus signifying the importance of the reform of the sector. Key to the success of this policy is energy diversification. The aim is to maximize the use of indigenous resources to achieve a more diversified energy mix (hydel 20%, coal 15%, LPG 2%, nuclear 3%, renewable 12%, domestic gas 21%, imported gas 7%, oil 20%). Indeed, U.S.-Pakistani relations are vital to the success of this development. When Mr. Dar met with U.S. Under Secretary of State Catherine Novelli they both agreed that energy remains the vital area that holds immense potential for enhanced cooperation. The U.S. has continuously stressed the importance of continuing to build momentum on expanded trade, investment and economic cooperation with Pakistan. “We are grateful to the United States for the economic cooperation as well as its assistance in the energy sector. Pakistan-U.S. cooperation in the energy sector has added 1400MW of electricity to our national grid. The U.S. is also supporting large hydroelectric projects like Dasu and Diamir Bhasha dams, initiated by Pakistan,” Mr. Jilani has stated. U.S. firms, namely GE Pakistan, have had a huge role to play in the Pakistani energy revolution. As the Chairman of the Pakistan’s Board of Investment, Dr. Miftah Ismail, says: “Some companies that are already present in the country are doing a great job, such as GE. A third of all power generation in Pakistan comes through GE turbines. The U.S. obviously has unbeatable technology, therefore we want to use their expertise.” The relationship is amicable on both sides, with GE more than happy to assist the development of the Pakistani energy sector. “We are proud to have been a partner of Pakistan in its development story; we have been involved in building dams, we have been involved in gas power plants, so almost a third of Pakistan’s power is generated using GE technology,” said Mr. Sheikh at a recent conference. GE established its roots in Pakistan with the country’s independence and has had a direct presence through its subsidiaries since 1980. GE has expanded its portfolio to support other GE businesses in addition to GE Power Systems (now GE Infrastructure Energy) located at Lahore, and has since been working actively with national companies and private businesses. Today, GE is a key player in supporting the development of the power sector, having signed a Memorandum of Understanding (MoU) to develop Pakistan’s energy resources to meet the projected demand of 54,000MW by 2020. In May 2015, GE reiterated its commitment to Pakistan when a high-level business delegation representing GE and M/s American Ethane Company visited Islamabad to show interest in setting up a new 6000MW ethane gas power plant in the country. Ethane – a smart, cost-effective and environment friendly fuel – burns up to 80% fewer emissions as compared to oil & coal and is suitable especially for areas not served by natural gas lines. Along with American Ethane, GE Pakistan is now considering setting up the large scale plant in order to help Pakistan further reduce its energy deficit. The announcement comes on the back of a MoU that GE signed last year with Pakistani firm Sapphire Electric Company Limited. The MoU is for the creation of ‘GE Predictivity’ solutions that will play an integral role in delivering more power to Pakistan, and help close a gap between the country’s power capacity and ongoing electricity demand. Terrorist attacks are coming down. Reclassification into Emerging Markets is highly probable. Growth rate is on an upward trajectory. In this article, I would apprise investors about the latest developments in Pakistan's economy, effecting NYSE: PAK ETF. Further, I would also give my opinion and analysis based on that development. One of the biggest news items that poured out of Pakistan was the suicide attack in Lahore, the second largest city of Pakistan, killing more than 70 people and rendering more than 100 injured. In my view, attacks like these are desperation on the part of militants as they are being denied space from all quarters within Pakistan. I believe, after the successful completion of on-going military operations in FATA (Federally Administered Tribal Area), the security environment will become much more conducive as compared to current situation. if we compare the number of bomb blasts to those which occurred during 2008-2013 era, then the security environment has improved remarkably. As the above graph shows, the trend is on downward trajectory. However, it is incumbent on the law enforcement apparatus of Pakistan to halt even sporadic incidents that have been happening lately. Granted, Pakistan has a law and order issue, which is largely limited to its western border but global financial markets have already incorporated its turbulent situation by jacking up the CRP (country's risk premium). I assume Pakistan's CRP would come down, given improving security landscape. The Habib Bank Limited said on Monday it had won a licence to operate a branch in the Chinese city of Urumqi, the first South Asian bank to be granted such a licence. The opening of the Pakistani bank in Urumqi, the capital of the violence-prone far-western region of Xinjiang, which borders Pakistan, will deepen ties between the two countries that last year signed a $46 billion agreement for infrastructure and energy projects. “HBL will be establishing banking operations in Urumqi, the largest city of the province of Xinjiang, which borders Pakistan along the traditional Silk Route,” the bank said in a statement. Up until April Pakistan’s government held a 42.5 percent stake in Habib, the country’s oldest bank. But it sold off its shares as part of Prime Minister Nawaz Sharif’s plan to privatise 68 public institutions, bringing in more than $1 billion. Pakistan last year signed an agreement for projects worth $46 billion with China to set up a China-Pakistan Economic Corridor (CPEC), in a boost to Pakistan’s crumbling infrastructure and energy sector. In return, China will get a free trade zone in Pakistan’s Gwadar port and access to the Arabian Sea. New Pakistani roads will open up routes for Chinese goods into Europe and the Middle East from landlocked Xinjiang, which borders Pakistan. Pakistan and China are celebrating 65 years of diplomatic relations. A number of ceremonies and activities have been scheduled to mark the occasion, starting on May 19 and continuing throughout the month. The celebration began on Thursday in Pakistan's Punjab Province. Seminars on the strong ties of friendship between Pakistan and China and a pictorial exhibition have been arranged at the direction of Punjab Chief Minister Muhammad Sheba Sharif. In line with the 65th annual celebrations, Pakistan's National Institute of Folk and Traditional Heritage, Lok Virsa, has planned a two-day "Chinese Mela" festival that will start on Saturday. Organized in collaboration with the Chinese Embassy, it will become "part of the on-going efforts of promoting a relationship of love and brotherhood between the people of two countries." The Mela will highlight Chinese culture, and cuisine along with Pakistani artisans, music and a photo exhibition, the institute's website said. Pakistan-China friendship has become a model for the world, said Federal Minister for Planning, Development and Reforms Ahsan Iqbal in an interview to APP. "China has been supporting Pakistan unconditionally for the last 65 years, while Pakistan has reciprocated to its time-tested friend's gestures positively," he added. "That's why, friendship between the two countries is considered higher than the Himalayas, deeper than the sea and sweeter than honey." Terrorism-related deaths have fallen 74 per cent from their 2010 peak, economic growth has accelerated to a solid 4.5 per cent, inflation has fallen sharply to around 3.3 per cent and the fiscal deficit has narrowed markedly to around 4.1 per cent of gross domestic product. Charles Robertson, global chief economist at Renaissance Capital, an emerging market-focused investment bank, says, on a per capita basis, the likelihood of being killed by a gun in the US is now higher than that of dying as a result of terrorism in Pakistan. But now the country may be about to be get some potentially bad news — an upgrade from frontier to emerging market status by MSCI. The index provider is due to rule on whether Pakistan has done enough to be promoted to EM status on June 14. And while this would be seen by many as a feather in Pakistan’s cap, at least one analyst believes it would have a sting in its tail — a partial exodus by foreign investors. Pakistan currently has a weight of 8.8 per cent in the MSCI Frontier index (making it the fourth largest country after Kuwait, Argentina and Nigeria) but is only likely to account for around 0.19 per cent of admittedly much more widely followed MSCI EM index if promoted. As a result, Hasnain Malik, regional head of frontier markets equity strategy at Exotix Partners, an investment bank focused on smaller markets, believes that, in theory at least, “in terms of potential funds flow, the ‘upgrade’ to MSCI EM would be a negative event”. Admittedly, Mr Malik says this calculation is based on a “simplistic” assumption that all frontier funds currently holding Pakistani stocks would sell as the new wave of EM funds moves in, which may or may not happen. Others disagree, however, believing that an upgraded Pakistan would attract net inflows from foreign funds, even though it would have the second-lowest weighting in the 24-nation MSCI EM index, above only the Czech Republic. When it comes to attracting fresh cash from actively managed EM funds, which of course would not need to buy even in the event of Pakistan’s promotion, Mr Salter believes their nose for a bargain will play a role. We met a diverse set of thirteen companies across the auto, banking, cement, consumer staple, insurance, media and power sectors and the mood amongst the corporates and other investors regarding the Pakistani economy in general was positive. The CPEC is a part of China's One Belt One Road initiative and it consists of investing a total of USD 45 billion over a fifteen year period in power, road and port projects. The majority of investment is expected to be in the power sector with a total of ~USD 34 billion to be spent on putting up new power capacity primarily using coal-based power plants. These new power projects are expected to lead to an increase of ~17,000 megawatts in generation capacity and this can go a long way in resolving the power deficit that Pakistan currently faces. Any improvement in the power situation will only be a positive for economic growth as there is a power deficit at present due to the mismatch between generation capability and demand. The other CPEC-related investments are linked to infrastructure projects such as highways, rail networks and ports. An important infrastructure initiative within the CPEC is the Gwadar port related project which besides further developing the port also includes an international airport and a highway. The CPEC could be a big positive for the Pakistani economy and though there is execution risk, the project is expected to be geopolitically important to both China and Pakistan. Another interesting company we met was "Shifa Intl. Hospitals," a hospital chain company which currently operates a hospital in Islamabad and Faisalabad and plans to expand capacity into Lahore. Besides this, the company also has a laboratory business which it could expand in the future. The fund is currently invested in this company. There was one bank present at the conference and the outlook for the Pakistani banking sector is soft as their margins are expected to come under pressure due to the reinvestment risk they face as a large portion of their government bonds are expected to mature in 2016. Having said that, most Pakistani banks are fundamentally sound in terms of loan loss coverage ratios and capital adequacy ratios. We also met with one of the leading auto companies in Pakistan, "Indus Motor Company Ltd." and their sales growth over the past year has been in double digits leading to capacity constraints which they plan to overcome in the short run but they would need new capacity in the long run. The Pakistan automobile market does hold a lot of potential as car penetration in Pakistan at 13 per 1,000 people is lower than India which is 18 per 1,000 people. A new auto policy recently passed by the government could bring more investment into the country and may also lead to more competition which could possibly lead to new model launches by the existing players and this can be positive for overall growth of the industry. We recommend to invest via MSCI Pakistan ETF (NYSEARCA:PAK) or through the AFC Asia Frontier Fund, which has currently 20.6% of the fund invested in Pakistan. The country’s per capita income rose 2.9 percent to $1,561 in the current fiscal year, a document revealed on Monday, as the stable exchange rate kept the growth nominal. “As the exchange rate largely remained stable so the per capita income also showed a nominal growth in the current fiscal compared to the last year,” said a source. The document, available with The News, said the per capita income was calculated at $1,517 for last fiscal year. The ministry of finance will release the figure of per capita income along with the upcoming Economic Survey (2015-16) before the announcement of the budget for the fiscal 2016-17. The per capita income grew 9.4 percent to $1,513 in 2014/15 over the preceding fiscal year. The latest per capita income was based on the population growth rate of 1.94 percent in the current fiscal year as compared to 1.98 percent in the previous fiscal year. The document further showed that investment to GDP ratio slightly declined in the outgoing fiscal year despite significant investment inflows from China under the $46-billion China-Pakistan Economic Corridor (CPEC). The State Bank of Pakistan (SBP) said foreign private investment in the country fell 64.7 percent to $635 million in July-April. It was $1.8 billion in the corresponding period of the last fiscal year. Foreign direct investment (FDI) and portfolio investments are the major components of the total foreign investment. In July-April 2015/16, the portfolio investment outflows amounted to $381.2 million as compared to inflows of $836.8 million in the same period a year ago. Chinese investment in the country jumped one-and-half time to $550 million, more than half of FDI in the first 10 months of the current fiscal year. The SBP said the FDI inflows from China amounted to $218 million in the corresponding months of 2014/15. The overall FDI posted a growth of 5.4 percent to $1.016 billion in July-April 2015/16 over the same period a year earlier. Sector-wise analysis revealed that power sector was the main recipient of FDI during the period under review. 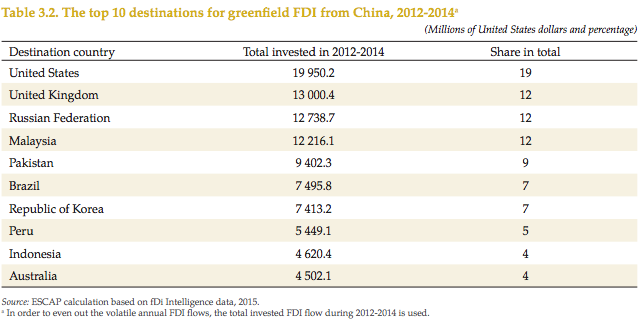 The inflows of FDI towards the sector posted a sharp growth of 208 percent to $518 million. The country is attracting foreign companies in various sectors. It attracted substantial amount of foreign investment in mid 2000s in banking and telecommunication sectors. The official data showed that the public sector investment was up to 3.8 percent of GDP in 2015/16 from 3.7 percent in 2014/15. It further showed that the savings to GDP ratio also declined slightly as it was down to 14.5 percent in 2015-16 from 14.7 percent. Pakistan achieved GDP growth of 4.7 percent in the fiscal year ending in June 2016, missing its target of 5.5 percent, the prime minister's office announced on Monday. The government has set a growth target of 5.7 percent for the next fiscal year, according to a statement. Pakistan's financial year runs from July to June. Nawaz Sharif's announcement comes ahead of Friday's presentation of his government's budget for the 2016-17 financial year. The government has set a growth target of 3.5 percent for the agricultural sector, 7.7 percent for the industrial sector and 5.7 percent for the services sector for the coming year. Friday's budget will include 1,675 billion rupees ($15.98 billion) in National Development Outlay, including 800 billion rupees ($7.63 billion) in federal funds and 875 billion rupees ($8.35 billion) in funds to the provinces, the statement said. Pakistan's economy, despite its missed targets, grew at its highest rate for eight years this year. It remains plagued by chronic power shortages, poor infrastructure and flagging exports, however. On May 21, Pakistan's central bank cut its key policy rate by 25 basis points to 5.75 percent, mainly over concern at the missed GDP growth target. In April 2015, China announced it would invest $46 billion in the China Pakistan Economic Corridor, a project that would link western China to the Arabian Sea through Pakistan, creating a major new trade route. "CPEC has the capacity for further contributing to GDP and will have far-reaching effect in consolidating the economic outlook of the country in years ahead," said Monday's statement. such as a BOT (build-operate-transfer). Under a BOT, developers set up and arrange loans to a special purpose vehicle (SPV) in the host country. Some 70-80% of the capital costs of construction will come from these loans, and the remainder will be provided by the developers through equity and / or other loans. The SPV then enters into all the contracts needed for the project, including an engineering procurement construction (EPC) contract with the contractor. If the funding is from China, this EPC contract will almost always be with a Chinese contractor. Conventional power projects are seen as particularly 'bankable' BOT projects, because the technology is usually tried and tested and there is a high likelihood that performance requirements will be met. These projects also do not generally require significant land acquisitions, or need extensive underground works, reducing the risk of delays and unforeseen problems. Many jurisdictions, in fact, now have standard form power purchase agreements and implementation agreements that offer to allocate project risks between the offtaker, the government and the developers in a split that is attractive to many lenders. It has taken Chinese contractors some time to get used to EPC contracts under project financed structures, as these tend to be tough on the contractor. Rates of delay and performance liquidated damages, and the caps on these, are generally much higher, and the contractor's rights to additional time and cost are limited. Many of these rights have to match the power purchase agreement that the SPV has negotiated with the offtaker. However, the upside for the contractor is that the developers are often willing to pay a higher contract price in return for the contractor taking on these additional risks. Where the finance for the project is coming from Chinese banks, the Chinese contractor may enjoy stronger bargaining power, although that is not always the case. There are plenty of Chinese contractors with the skills needed to build these power stations, and developers will often use the threat of switching negotiations to a competing contractor to get their way in negotiations. Even before the launch of OBOR, the larger and more experienced Chinese contractors had begun the transition from a traditional contractor business model to a 'contractor plus investment' model. Now, the signs are that a significant proportion of OBOR projects will involve Chinese contractors making investments in the projects that they are engaged to construct, and conventional power projects have been among the first to use this structure. The China Pakistan Economic Corridor (CPEC) has been among the first to see innovative project structures. The Thar Coal Block II project involves the development of an open pit coal mine and 660MW mine mouth power station through two SPVs set up by a consortium of Pakistani and Chinese investors, including a major Chinese contractor who will act as both EPC contractor and SPV equity participant. Project finance loans, including conventional RMB and Rupee Islamic tranches, are provided by syndicates of Pakistani and Chinese lenders including Habib Bank, United Bank, China Development Bank, Industrial and Commercial Bank of China and Construction Bank of China. Pakistan is targeting the fastest growth in more than a decade, proposing cutting taxes to boost exports and support farmers in its spending plan as it wraps up a three-year, $6.6 billion International Monetary Fund loan program. Pakistan proposed a zero-rated sales tax regime for five export industries, including textiles, leather, surgical instruments, sports goods and carpets, Finance Minister Ishaq Dar said Friday while presenting the government’s 4.89 trillion rupee ($46.7 billion) budget for the fiscal year starting July 1. The fiscal deficit is estimated to decrease to 3.8 percent next year from an estimated 4.3 percent, he said. The spending plan will probably be approved by Parliament this month. Gross domestic product is forecast to expand 5.7 percent in the year starting July 1 on higher infrastructure spending, Prime Minister Nawaz Sharif said this week ahead of the budget presentation. If Sharif is successful, it will be the first time in at least a decade that any Pakistani government has hit a growth target. Nonetheless, the economy’s accelerating expansion since he took office in 2013 has put Pakistan’s stocks and currency among Asia’s best performers during that time. For the coming year, Sharif aims to spend 1.68 trillion rupees to build roads, dams and ports, a 14 percent increase. The nation is also looking to add power plants to end electricity shortages in two years, while also maintaining a fight against militants who have killed 60,000 people since 2001. Investments from China are also set to rise. The $45 billion China Pakistan Economic Corridor is getting under way and will contribute to growth, Sharif said last month. “Chinese investment will start kicking in that will help end the energy crisis and there is a possibility of a rebound in agriculture,” said Yawar uz Zaman, head of research at Karachi-based Shajar Capital Pakistan Pvt. Even so, the government may struggle to reach its target, he said. As always in Pakistan, risks are ever present. Sharif’s efforts to privatize entities like Pakistan International Airlines Corp. have also met resistance. A recent tax amnesty to boost government revenues flopped, and an interest-rate cut by the State Bank of Pakistan last month as inflation quickened caught investors by surprise. The military also eats up about a fifth of total spending. The defense budget has been increased 11 percent to 860 billion rupees and a separate 100 billion rupees is allocated for a military offensive against militants and to support people displaced by the operations, Dar said. Even so, analysts see Sharif sticking broadly to the IMF targets as the program concludes. All end-March 2016 quantitative performance criteria, including the budget deficit target and the floor on the central bank’s net international reserves, have been met, the IMF said May 12. Pakistan is targeting a 16 percent rise in tax revenues in the year ending June 2017, Finance Minister Ishaq Dar said on Friday as he unveiled a budget aimed at shoring up the South Asian country's finances. Dar said Pakistan would target a fiscal deficit of 3.8 percent of gross domestic product for the coming financial year, down from the 4.3 percent envisaged for this year. He told parliament that the aim was to push Pakistan's persistently low tax-to-GDP ratio to above 10 percent and raise revenues from taxation to 3.95 trillion rupees ($37.8 billion)from 3.42 trillion this year. Pakistan's financial year runs from July to June. Pakistan's economy grew at an estimated 4.7 percent in the year to June 2016 - short of the government's 5.5 percent target but the highest rate for eight years - after a slide in oil prices and growth in industry and services boosted demand. Investor confidence has slowly returned to a country that was battered by the global financial crisis. But the economy remains structurally weak, hamstrung by poor infrastructure, the threat of militant violence and narrow tax base. Chinese state-backed firms are frontrunners to buy a $1.5 billion controlling stake in Pakistani utility K-Electric, sources said, as they bet the benefits of a Beijing-led economic corridor will trump the risks of investing in Pakistan. State-backed Shanghai Electric Power (600021.SS) and China Southern Power Grid are among Chinese firms leading the pack of about half a dozen bidders in K-Electric KELA.KA, one person familiar with the matter said. Shanghai-headquartered Golden Concord Holdings is also among the bidders, as are some local Pakistani and other companies, according to people who know about the process. Chinese companies' interest comes after China last year announced energy and infrastructure projects worth $46 billion in the South Asian nation, with a view to opening a trade corridor linking western China with the Arabian Sea. "The China-Pakistan Economic Corridor (CPEC) is the main driver, with a lot of Chinese funding flowing into Pakistan," said one person aware of the K-Electric deal. That demand underpins President Xi Jinping's ambitious "One Belt, One Road" initiative, under which Beijing is seeking to open new trade routes and markets as the domestic economy slows. Under the program, Chinese companies invested nearly $15 billion in participating countries last year, up one fifth from 2014. If successful, the K-Electric deal would be the biggest M&A agreement in Pakistan in a decade. Large tracts of Pakistan's economy remain nationalized or held by private businessmen with little interest in selling to new investors. Chinese firms are eyeing new Pakistan power projects, roads and some engineering contracts but investing in a large private company that deals directly with consumers would be a first, a senior Karachi-based financial adviser said. Dubai-based private equity firm Abraaj Group, whose 66-percent stake in K-Electric has a market value of about $1.5 billion, is seeking final bids for its stake by the end of August. Sources cautioned that although talks between the parties are advanced, there is no certainty of a deal being clinched. The Pakistani government owns about 24 percent, but a spokesman for the water and power ministry said it was not in talks to sell. CPEC envisages the construction of roads, pipelines and power plants across Pakistan that run south to Gwadar port and should mean more business for distribution companies like K-Electric that sell the electricity to users. China and Pakistan call each other "all-weather friends" and their ties have been underpinned by long-standing wariness of their common neighbor, India, and a desire to hedge against U.S. influence in the region. Islamabad wants Chinese funding to reinvigorate an economy hurt by militant violence and weak productivity, to provide new jobs and to ease chronic power shortages. For China, markets like Pakistan and Malaysia are opening up new frontiers, just as it faces hurdles in countries including Australia. "We are getting a lot more enquiries from Chinese investors about Pakistan in the last couple of years," said Muhammad Sohail, CEO at Karachi-based brokerage Topline Securities. "Before it was always U.S. and Europe. The Chinese are coming," Sohail added. Still, foreign investment in Pakistan remains relatively muted as it struggles to shake off a reputation for violence, corruption and instability, and despite the $250 billion economy growing at its fastest pace in eight years. Inbound M&A into Pakistan has risen more than six times in the past five years, totaling $516 million so far this year, according to Thomson Reuters data. hina’s state-owned Shanghai Electric Power Co. plans to acquire a controlling stake in Pakistani power utility K-Electric Ltd., in a deal that could be one of the biggest foreign investments in Pakistan’s history. In a notification filed with the Pakistan Stock Exchange Tuesday, Shanghai Electric said it intends to purchase the 66.4% stake in K-Electric currently held by The Abraaj Group, a Dubai-based investment firm. K-Electric shares, included in the Pakistan Stock Exchange’s benchmark 100-index, closed at 9.21 Pakistani rupees ($0.09) Tuesday, valuing Abraaj’s stake in the utility at 168.9 billion rupees, or $1.6 billion. K-Electric supplies power to Pakistan’s largest city and economic hub, Karachi, home to around 20 million people. The company has a customer base of 2.2 million, and 11,000 employees. The acquisition would be the largest investment in a Pakistani company by a Chinese firm, and a boost to Prime Minister Nawaz Sharif’s government, which considers increasing foreign investment a key component of its economic policy. If completed, Shanghai Electric’s purchase will be the third major foreign investment this year in Pakistan, dwarfing the $258 million acquisition of Pakistani appliance maker Dawlance by Turkey’s Arçelik A.Ş. in June, and Netherlands-based Royal FrieslandCampina N.V.’s acquisition of a 51% stake in Engro Foods Ltd. for an estimated $450 million in July. Work is also under way in Pakistan to build the China-Pakistan Economic Corridor, a $46 billion, multiyear Chinese investment program connecting the two countries. A bulk of the investment will be in Pakistan’s energy sector, and the government hopes the new power plants will help end electricity shortages that have hampered economic activity for years. Pakistani officials also hope the corridor will help the country industrialize and boost growth. Economic managers of Pakistan have given the go-ahead to Kuwait Petroleum Corporation for setting up an oil refinery in the coastal area of Balochistan – a welcome investment initiative for the largely under-developed province, which will reduce the need for import of refined petroleum products in the country. The Economic Coordination Committee (ECC), the highest economic decision-making body, took the decision in a meeting held on September 7 in response to Kuwait Petroleum’s interest in pouring capital into setting up a refinery in Balochistan, said an official aware of developments. The ECC also decided to seek an extension in the timeframe for oil import credit facility from three to four months in an effort to ease pressure on the country’s foreign currency reserves. It directed Pakistan State Oil (PSO), the state oil marketing giant, to try and persuade Kuwait Petroleum to extend the existing credit facility from 90 to 120 days or even more. In another decision, the ECC permitted import of furnace oil and jet fuel from Kuwait without resorting to competitive bidding. At present, PSO imports diesel from the Gulf Arab state on 90-day deferred payment. A representative of the Ministry of Petroleum and Natural Resources, who was present in the ECC huddle, said before the year 2000, Pakistan purchased diesel from Kuwait under a long-term contract with the Gulf state’s government. However, in the wake of market deregulation, Pakistan government in 2001-02 asked PSO to enter into a fuel supply contract with Kuwait Petroleum. Immediately after that, the two sides inked an agreement for the sale and purchase of high-speed diesel only with payment guarantees from the government of Pakistan. Now, this agreement has been in place for the last around 15 years. Earlier, Kuwait Petroleum had expressed interest in exporting furnace oil and jet fuel as part of the existing arrangement and was looking to install an oil refinery in the coastal area of Balochistan with storage facilities. “Pakistan and Kuwait have an old bilateral relationship in terms of oil trade and Kuwait Petroleum is a time-tested supplier, well-reputed for the most economical supplies, product quality and supply security,” an official told the ECC meeting. The Ministry of Petroleum and PSO suggested that furnace oil and jet fuel could be included in the existing sale and purchase contract by making an addition to it. This could be done by invoking rule-5 of the Public Procurement Regulatory Authority (PPRA) Rules 2004, which provides for waiving mandatory public procurement procedures in case of an international or inter-governmental commitment of the federal government. The ministry took up the matter with the PPRA and Law and Justice Division for legal advice. Later, the PPRA endorsed the proposal. The Law Division, on its part, pointed out that the contract was linked with the agreement between Pakistan government and Kuwait Petroleum and new products could be added. Therefore, it would be treated and read as an integral part of the existing contract. After examining the proposal from legal point of view, the Law Division cleared it subject to meeting all formalities. Byco is now ahead of all refineries in Pakistan following the completion of its second unit, as its crude oil refining capacity has gone up to 155,000 barrels per day from 35,000 barrels per day. Asad Siddiqui, Byco Chief Financial Officer (CFO) of the complex, talking to a select group of journalists here on Monday said the second unit of the refinery has completed, enhancing its refining capacity by 120,000 barrels per day, making it the country's largest refinery. He said that Byco has crossed Pak Arab Refining Company (PARCO) which has the refining capacity of 90,000 barrels per day, followed by 68,000 barrels of National Refinery, 48,000 barrels of Pakistan Refinery Limited and 45,000 barrels of Attock Refinery. Replying to a question regarding expected removal of international sanctions against Iran, he said that if the sanctions are lifted Byco Refinery is all set to take the advantage of expected crude oil imports from Iran at discounted rates. Byco CFO said that his company was well placed to benefit from removal of international sanctions against Tehran unlike the country's other refineries which had long term crude supply contracts. "It is comparatively difficult for other refineries to switch over because of their long term agreements" but Byco has the potential to quickly take advantage of the emerging opportunity. He said perhaps Iran would also offer discount on crude oil to open up its market and it would be a good omen for Pakistan. He said Byco had completed one of the two new projects for isomerization and desulphurization and it had relatively short term crude supply agreements that provide flexibility for Iranian crude. He said the Byco also had past experience of refining Iranian crude before its supply had suspended due to international sanctions. He said because of consolidated business model, the company would be declaring profit for the first time for the quarter ending June 30, 2015 that would set the direction for its improved financial position in future. He said the Byco management had decided to consolidate its refining business before going into expansion of retail outlets, adding that so far Byco was operating 250 petrol pumps across the country. "The focus of our marketing has been on furnace oil sales and we have been able to secure furnace oil business from Nishat Chunia, K-Electric, Tapal, Liberty and Hub Power Company", he maintained. He said Byco was facing problems because of the issue of turn over tax, but the authorities had not only understood the tax anomaly but was committed to issue an enabling clarification. He explained that refinery was set up under tax-holiday for seven years when there was no turn over tax which was imposed subsequently and the government had agreed to do away with it. He said about 95 per cent of the oil pricing was based on crude price which meant that turn over tax could simply eat away the entire profit. He said that due to the completion of isomerization and desulphurization of within plants into a couple of months it would convert its entire Naphtha production into motor spirit that would almost double its production from 12,500 barrels per day to cut costs. He said the government had appreciated the co-operation extended by the Byco in controlling petrol crisis early this year and now looked forward to take benefit of its location and infrastructure. He said the company could directly provide furnace oil to Hubco next door while Pakistan State Oil was also taking full advantage of Byco's strength of its own port facility in the shape of single point mooring. Siddiqui said all major oil marketing companies including PSO, Hescol, Caltex and Shell in that order and other smaller companies were lifting products from Byco refinery. In the Indian Ocean region, OBOR has two aspects. One is the Maritime Silk Road, a series of linked port projects aimed at facilitating trade and new production chains linked with China by sea. The other is a series of planned north–south pathways from China to the Indian Ocean, including the China–Pakistan Economic Corridor (CPEC) and the Bangladesh–China–India–Myanmar Economic Corridor. These projects come with huge price tags and would involve the construction of roads, railways, pipelines and other major infrastructure in corridors stretching for hundreds and even thousands of kilometres. But these new overland pathways also have the potential to fundamentally alter China’s role in South Asia and the entire strategic make-up of the region. Geopolitically, South Asia has long functioned more or less as an island rather than as part of a bigger continent. Any overland connections that South Asia has with the rest of the continent are, at best, tenuous and excepting a tiny proportion of trade that is carried overland to and from Eurasia, essentially all of South Asia’s connections with the rest of the world are by sea or air. These geographic constraints have had considerable political, economic and strategic consequences for the region. One is in underpinning India’s role as South Asia’s predominant power. The relative lack of landward connections into the Eurasian continent also amplifies the importance of control over the maritime trade routes across the northern Indian Ocean. Geography has also caused Eurasian states, such as China, to have very limited contact with their South Asian neighbours. Sitting on the other side of the Himalayas, China may as well have been on the other side of the world. While it has been a strategic player in South Asia for some time, it has been from far away. China’s virtual remoteness allowed it to keep its hands clean of domestic political and security problems, even while it provided substantial military and diplomatic support to the Pakistani government. This has helped China to project itself as a benevolent partner that does not ‘meddle’ in internal affairs. Pakistan has sought to address CPEC security risks by forming a special army corps of 12,000 personnel devoted to protecting the project. But, at least until recently, China has been surprisingly sanguine about these risks and its ability to rely on the Pakistan Army. In August 2016, in a national Independence Day speech, Indian Prime Minister Modi sent a clear message that India may begin to publicly support Balochistan’s separatist insurgents. This represents a big shift for India and was directed almost as much at Beijing as at Islamabad. A senior and well-connected Chinese scholar responded that China will have ‘to get involved’ if India seeks to disrupt the CPEC. On 21 September, in the wake of the deterioration in Indo–Pakistan relations over Kashmir, Chinese Premier Li Keqiang publicly warned his civilian Pakistani counterpart, Nawaz Sharif, that he ‘hoped’ Pakistan can continue to provide safety protection to the program construction and Chinese personnel in Pakistan. These may well be the opening moves to a whole new strategic dynamic in South Asia driven by China’s great OBOR ambitions. Foreign investment in the country flourished after a long pause and a growth of 10 percent to $1.080 billion was recorded in the six months of the current fiscal year, the State Bank of Pakistan data showed. The economic measures according to an analyst started paying some dividends as after a long gap in the first six months the barrier of $1 billion has been crossed. However, the stock market was on the losing side as the foreign fund managers repatriated their investment during July to December period. Outflow from the Pakistan Stock Exchange stood around $254 million as against $236 million of the same period last year or 2015. There has been general tendency among the foreign fund houses to pull out from the emerging markets as they felt that with the rising interest rates and hope of further rise in the US in 2017, the best option to park their funds would be the US treasury or bonds. Another analyst said that foreign direct investment recorded increase because of one time arrival of payment received from the Netherland as they bought majority of stakes of Engro Foods amounting to $464 million. Another factor which increased the net foreign investment climbing by 52.5 percent to $1.804 billion was the issuance of the Euro Bonds by the government during the period. The government and economists mostly bet on China Pakistan Economic Corridor (CPEC) as the project would yield around $5 billion dollars year in the coming years. Pakistan expects net foreign direct investment (FDI) to jump about 60 percent in 2017/2018, the chairman of Pakistan’s Board of Investment said, but some Western investors appear to be put off by China’s growing influence in the South Asian nation. Chinese investment has helped spur Pakistan’s economic growth to more than 5 percent, its highest in a decade, while also increasing Beijing’s clout in Pakistan at a time when Islamabad’s relations with the United States, an historic ally, are fraying over Pakistan’s handling of Islamist militants and the conflict in Afghanistan.